*More info : nextmaruni/International design competition. o-d-a is design group located in Bangkok, Thailand. Consists of two members, Ms. Jutamas Buranajade (1980) and Mr. Piti Amraranga (1980) born in Bangkok. 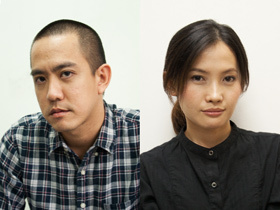 Both have graduated from the Faculty of Decorative Arts at Silpakorn University. o-d-a was one of the 10 Finalists of the “Tokyo Designers Block Competition 2003″. Won the ‘Grand Prix’ of Nextmaruni Wooden Armchairs Competition 2005, judged by Jasper Morrison. Was awarded ‘The Honourable Mentions’ of Promosedia International Design Competition 2007. Participated in ‘FRAGILES’ exhibition at Design Miami 2007. Was ‘Finalist’ of International Furniture Design Competition ASAHIKAWA 2008 and 2011. And was awarded as THAILAND ‘Designer of the Year 2011′. Currently designing children furniture for the Japanese brand, Katoji and producing their own works as o-d-a brand.